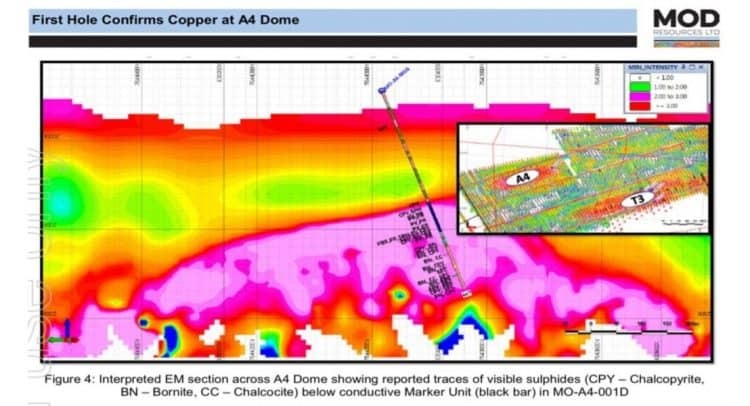 Copper mineralisation intersected by first drill hole at A4 Dome target, the first of seven ‘buried domes’ planned to be drilled within the T3 Dome Complex. A4 Dome is circa 5km long and is located 6km west of T3 Project. Drill hole MO-A4-001D, near eastern end of A4 Dome, has intersected visible copper sulphides hosted in intermittent veins over a wide interval from approximately 360m to 450m down hole. Traces of fine to coarse grained copper minerals (chalcopyrite, bornite and chalcocite) occur within numerous quartz/carbonate veins, hosted by shallow dipping sediments below the interpreted EM geophysics conductive ‘T3 Marker Unit’. Drilling of MO-A4-001D currently ongoing (current depth 490m), drill core requires detailed geological logging, sampling and assay results before the significance of the copper mineralisation can be determined. MO-A4-001D being deepened to test the target Ngwako Pan Formation (NPF) prospective contact interpreted to occur below the mineralised sequence intersected to date. Two additional drill rigs are being deployed to test other targets within the more structurally complex core of the A4 Dome, west of MO-A4-001D. T3 Dome Complex Drilling Programme is a major drilling campaign to test numerous geophysical targets along the T3 Dome Complex (announced on 15 May 2018). Drilling currently underway at the A1 Dome circa 25km northeast of the A4 Dome, and at the A9 Anomaly circa 5km northeast of A4 Dome. A1 Dome is one of Tshukudu’s highest priority targets within the T3 Dome Complex and A9 is an unusual pipe like conductor adjacent to a regional dolerite dyke. Approximately 60 diamond core drill holes have been budgeted during the Phase 1 drilling along the T3 Dome Complex. The objective of the planned drilling is to confirm the prospective geological sequence and structures occur within the initial seven interpreted domes. Holes are being drilled in areas of structural complexity to test for vein hosted deposits of the ‘T3 Type’, and to test the underlying prospective Ngwako Pan Formation (NPF) contact which hosts other substantial copper deposits in the eastern part of the Kalahari Copper Belt. The Phase 2 drilling at the T3 Copper/Silver Deposit commenced on 7th August 2017, with approval granted for the recommencement of both diamond core (DC) and reverse circulation (RC) drilling at the T3 Project and its vicinity, through to December 2018. This includes up to 70 planned diamond core drill holes designed to infill the current Resource and test for possible extensions. The objective of the infill program is to increase geological confidence and upgrade categorisation of the T3 Resource. The programme also includes grid drilling to investigate the potential for an underground Resource down-dip and along strike from the planned open-pit, and to investigate geophysical targets. Drilling approval has been granted for the wider T3 Dome with the acceptance of the T3 Dome EMP announced on 3 April 2018. The results of the T3 Open Pit Pre-Feasibility Study were announced on 31st January 2018. The T3 Open Pit Feasibility Study, towards a decision to mine, is currently underway. The technical information contained in this disclosure has been read and approved by Mr Nick O’Reilly (MSc, DIC, MAusIMM, FGS), who is a qualified geologist who acts as the Competent Person under the AIM Rules – Note for Mining and Oil & Gas Companies. Mr O’Reilly has visited the T3 site and reviewed MOD’s drilling and sampling protocols and procedures. Mr O’Reilly is a Principal consultant working for Mining Analyst Consulting Ltd which has been retained by Metal Tiger PLC to provide technical support. In addition to its 30% interest in the JV, Metal Tiger holds 13,880,042 MOD shares, equivalent to 5.996 % of MOD’s issued share capital and 154,167 MOD options each exercisable price of 6 cents (Australian) on or before 15 April 2019.